Letting Exte Ransomware onto the Windows operating system is a huge mistake because this infection can lead to the permanent corruption of your personal files. Although it is believed that the encryption algorithm used by this threat will become decipherable in the near future, we cannot guarantee this. Of course, if this ransomware has attacked your PC and encrypted your files, you should not rush to do what the creator of this infection wants you to do. Instead of initiating communication with them and then, potentially, paying a ransom, you should look for a free decryptor that, hopefully, would free your personal files. We are hopeful about this because other infections that derive from the same family, including Mole Ransomware, CryptoShield Ransomware, and Revenge Ransomware, are all “decryptable.” Our research team has thoroughly inspected this malicious infection, and if you want to learn more about it, the information you can find in this report will be very useful. We also discuss the removal of Exte Ransomware because this task is extremely important, and you should take care of it as soon as possible. Do you have any idea as to how Exte Ransomware got into your operating system? Was it executed as you opened a corrupted spam email attachment? Or did you let it in when executing a malicious software bundle? You might not figure out how exactly this threat got in, but if you do, make sure you do not make the same mistake again. For example, if you have opened the launcher of the threat via a spam email, you should become more cautious about that. In fact, our research team strongly recommends deleting spam emails as soon as you find them. Do not interact with the attachments or the links represented via them. Once the infection is executed, it starts the encryption process right away. Exte Ransomware adds itself to the startup to ensure that the infection is active even if the victim restarts the computer. During the encryption, the infection attaches the “.EXTE” extension to the names of all encrypted files, but the worst part is that it also changes the names of these files, which can cause problems identifying them. Hopefully, you are sure that most important files are backed up, and you do not need to worry about the rest. To introduce the victim to the ransom demands, Exte Ransomware creates the “_HELP_INSTRUCTION.TXT” file. This file displays a message that urges you to contact exte1@msgden.net, exte2@protonmail.com, or exte3@reddithub.com. You are instructed to send your ID – which is also displayed within the message – to one of these email addresses to get more “specific” information. What does that mean? If you email the creator of Exte Ransomware, you will get instructions showing how to pay a ransom. Because of this, we are not sure how big the ransom that the infection demands is. Overall, whether it is 1 USD or 1000 USD, you should refrain from paying it because that would not lead you anywhere. Do you think that cyber crooks would provide you with a legitimate decryption key if you paid the ransom? Well, that is unlikely to happen, and so we do not recommend getting involved. The removal of the ransomware, on the other hands, is unquestionable, and you should take care of the threat as soon as possible. More importantly, you should take care of your system’s protection to ensure that you do not face other threats in the future. The manual removal guide below is not too hard to follow if you have at least a little bit of experience with the elimination of unwanted software. Of course, you do not have to go through with manual removal. Instead, you can install an anti-malware program, and we think that that it is the better option. Why? Because reliable anti-malware software can simultaneously delete Exte Ransomware and reinforce the overall system’s protection you need. When it comes to the decryption of your files, we have already discussed that paying the ransom is a bad idea. 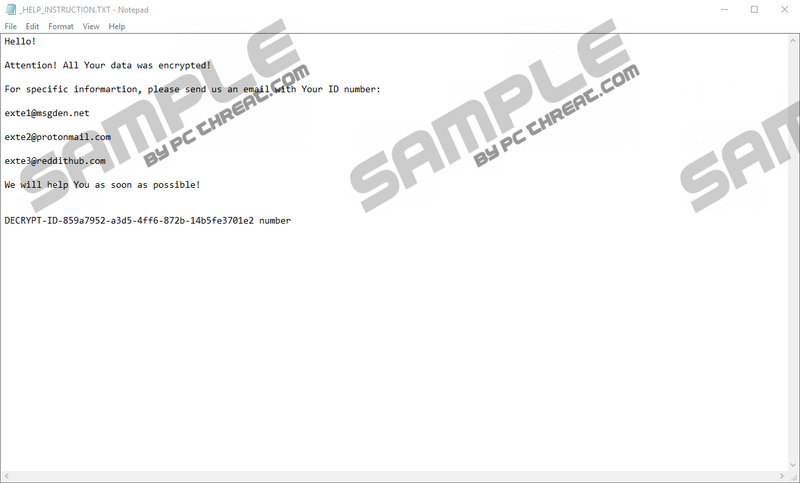 We have also discussed that a legitimate file decryptor is likely to emerge, so keep an eye out for it. After you get your operating system cleaned and, hopefully, files restored, you need to ensure that your PC stays malware-free in the future. Also, you should back up your files – if you have not done this already – because that can save you from permanent loss in the future. Type regedit.exe into the Open box and click OK. In Registry Editor move to HKEY_CURRENT_USER\SOFTWARE\Microsoft\Windows\CurrentVersion\Run. Delete two values with random names (e.g., 00FF0EBCF2F2 and BC0EBCF2F2) that represent malicious files in the %AppData% directory. Delete two malicious .exe files that have the names of the values we already deleted (e.g., BC0EBCF2F2.exe and BC0EBCF2F2.exe). Move to your recycle bin, right-click it, and choose Empty Recycle Bin. Install a trusted malware scanner and immediately perform a full system scan. Quick & tested solution for Exte Ransomware removal.